January is not known to be the prime time for visiting Paris. It’s cold, it’s often rainy, and if it snows, it’s often accompanied by a biting wind. As I am not a fan of the cold, January is not my favourite time in Paris, but it does have a couple of things going for it. For example, because there are very few visitors in France at this time, the lines at most major attractions are practically non-existent, meaning you have a chance to actually see the Mona Lisa as opposed to viewing her through the screens of hundreds of phones and tablets. Then, once you’ve basked in the glory of conquering the Louvre, you can stop by your local bakery to indulge in my personal favourite January tradition, the galette. Just What, Exactly, Is Galette? Basically, a galette is a rounded puff pastry filled with frangipane or apple, which is often served with apple cider or champagne. I had never even heard of galette prior to moving to France, but during my first January in Paris, it was hard not to notice how every boulangerie in the city seemed to be selling out of them at an astonishing rate. It wasn’t until I was invited to my first ever galette party that I discovered that this pastry is so much more than just a delicious dessert. Its full name is Galette Des Rois (King’s Cake), and galettes are part of a tradition that dates back centuries. In France, galette is traditionally served on January 6th to mark the Epiphany and to celebrate the arrival of the three Kings bearing gifts for the baby Jesus. Since the 14th century, galette has been served as a way of drawing Kings towards the Epiphany, and while the celebration is centred around January 6th, galettes can be bought throughout the month. In fact, they are so popular, boulangeries often sell out long before closing time. However, enjoying a galette is a bit more complicated than simply buying one at a bakery and consuming it on the way home. Like most things in France, there are a lot of etiquette rules around these cakes, and they mostly have to do with a tiny piece of plastic hidden within them called a fève. That’s right, you read that correctly. These cakes have tiny little choking hazards baked right inside of them. There is only one fève per galette, and if you find this prized piece of plastic or tile in your slice, you are named King or Queen for the day. 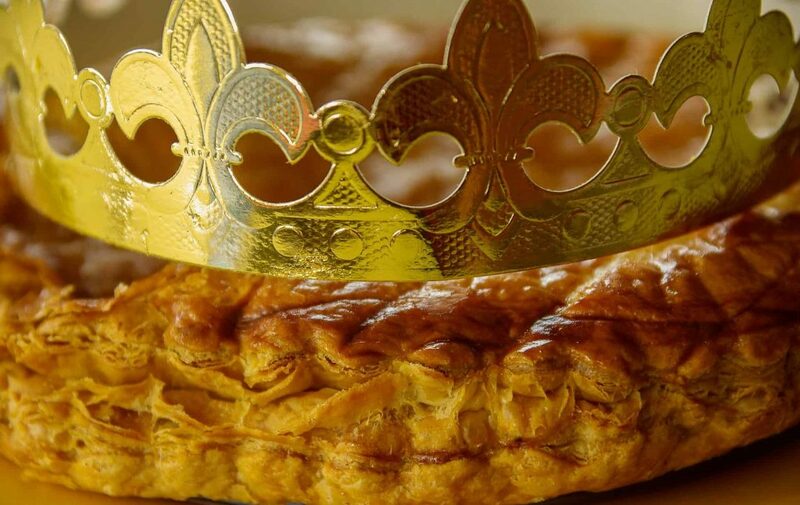 This means you get to wear the crown that often comes with the galette, and you are now officially responsible for bringing the galette to the next gathering. You also get to keep the fève, with some people maintaining collections going back decades. As you can imagine, it’s quite the honour to find the fève, and therefore to ensure equal opportunity for everyone, tradition dictates that the youngest person at the gathering sits under a table and decides who gets which slice. Tradition also dictates that an extra slice is set aside in case someone in need of a meal happens upon your gathering. Needless to say, I knew nothing about all this when I attended my first galette party, and in particular, everyone failed to warn me about the fève. As you’ve probably already guessed, trusty beginner’s luck kicked in, and I promptly discovered the fève in my slice. And by discovered, I mean I nearly broke a tooth, which was why I was so confused by the cheers I received when I pulled a small plastic toy out of my mouth. That being said, once I knew what it meant, I wore my crown with pride, and I now look forward to galette every January and the chance to add to my collection. I haven’t found one since.